Chocolat Moderne's line of "Cocoa Casbah" are drinking chocolates (aka hot chocolate), but can also be used in cocktails or as ice cream topping. 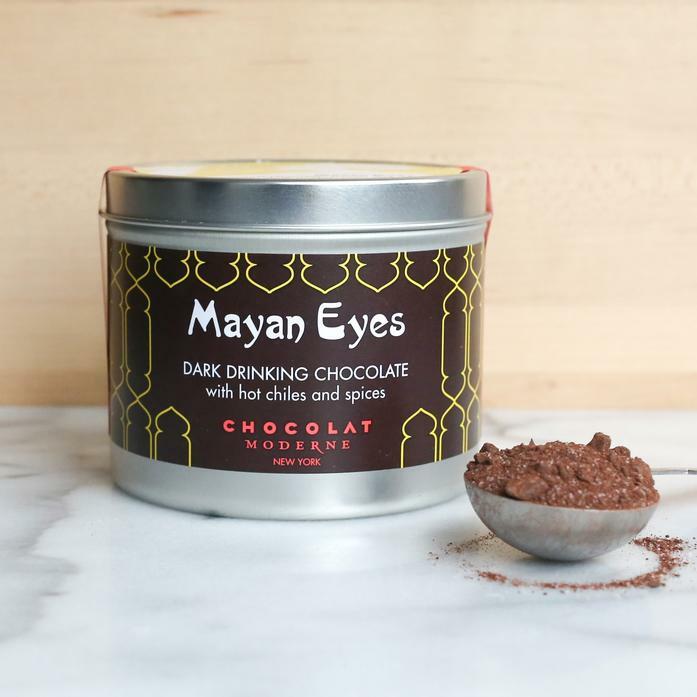 Mayan Eyes starts with a base of 70% dark chocolate layered with heat of chiles, sweetness of cinnamon and complexity of nutmeg. Ingredients: Dark chocolate with cocoa content in excess of 70% (cocoa beans, sugar, cocoa butter, soya lecithin, vanilla), sugar, cocoa powder, cinnamon, nutmeg, chipotle (smoke-dried jalapeño pepper), chile ancho (dried poblano pepper), pectin, vanilla.